Two magnificent tidal pools to explore with a whole lot to do’s. Amazing atmosphere. The restaurants and bars in the area, each have a unique character, all within walking distance. Numerous family attractions are to be found near the beach & soon the day at the Point Beach turns into so much more. The wide, sandy beach offers breath-taking views of the whole of Mossel Bay, the Harbour, the sea and the remarkable Outenique Mountains. The spectacular Victorian-Style beach Pavilion is one of Mossel Bay’s “must see” historical buildings. It was built over 100 years ago & is home to the Santos Pavilion Restaurant. Pubs, restaurants, shops and museums are all within walking distance. From a golden beach to take long peaceful walks on, to a variety of family activities. Dias has it all. A heated pool and waterpark, a relaxing day at the spa, restaurants & entertainment for the youngsters, all within walking distance. With the Langeberg Mall, Hartenbos & Mossel Bay Central are all within a 7km range, the possibilities are endless. Two magnificent tidal pools to explore with a whole lot to do’s. Awsome atmosphere. The restaurants and bars in the area, each have a unique character, all within walking distance. Numerous family attractions are to be found near the beach & soon the day at the Point Beach turns into so much more. Come and experience some of the most beautiful sunrises. A peaceful atmosphere with the mountains in the background together with the walkway along the sea adds to a relaxing experience. Bars, restaurants and numerous family attractions are all within walking distance. Mossel Bay is one of the most popular Holiday destinations. Mossel Bay Central have a large variety of restaurants, coffee shops and pubs, all within walking distance. With alot attractions such as Bartlomias Dias Museum, Post Tree & Lighthouse all within walking distance, which makes it an ideal destination. The wide, sandy beach offers breath-taking views of the whole of Mossel Bay, the Harbour, the sea and the remarkable Outenique Mountains. The spectacular Victorian-Style beach Pavilion is one of Mossel Bay’s “must see” historical buildings. It was build over 100 years ago & is home to the Santos Pavilion Restaurant. Pubs, restaurants, shops and museums are all within walking distance. “We have been frequenting and staying for 2 weeks or more at Point Village for the past 10 years. The communication is clear, the house is clean on arrival and the inventory ensures that all your needs are attended to – i.e. cooking, sleeping, bathing, television, etc. We were once again very happy with the accommodation standards." 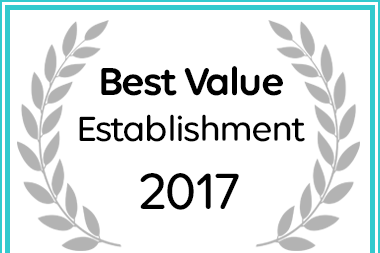 Point Village Self Catering Accommodation has been named a Best Value Mossel Bay establishment.